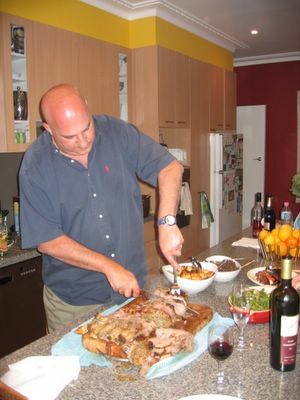 I recently mentioned that I was going to be cooking for a big real grown-up dinner party. That was on Sunday night. 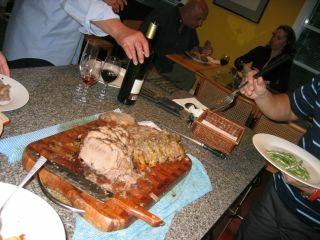 We had 9 people in total: my family (4 of us), my friend Frances, and 4 of my parents' friends (the grown-up contingent). 2 of them are a husband and wife team who run a fabulous Lebanese restaurant, and the other couple run a similarly fabulous bakery nearby. I had a hard time planning the menu - obviously Lebanese food was out of the question. 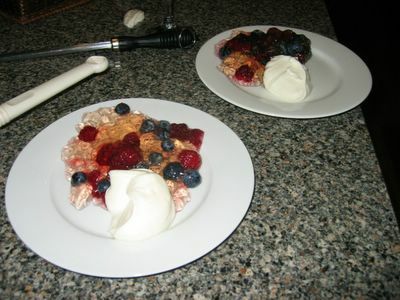 I wanted to make something that was fancy but not too try-hard, reasonably easy to make, and above all - delicious! After a week of frantically searching through all my cookbooks, and asking almost every single person at work, school, and everywhere else, I decided on a menu. As you can see, it's pretty much a normal roast beef meal, but made slightly special with flavourings and a fancy dessert. 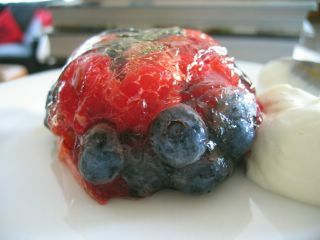 Earlier in the week I trialled the jelly in individual moulds, and it was very pretty, but difficult to work with. 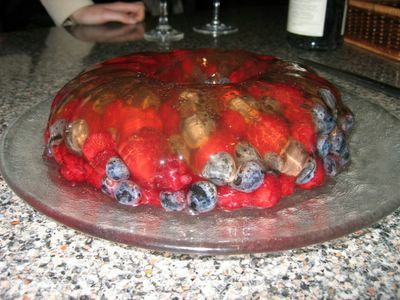 This is the jelly I made for a trial - as you can see, there is a lot of fruit and not enough jelly. Additionally the jelly wasn't very firm and a bit messy around the edges. For the dinner party itself, I made it in a large ring container, used less fruit and a bit more gelatine. You basically dissolve gelatine leaves in elderflower cordial, add sugar and sparkling wine, and pour it over chilled fruits in a mould. Although the recipe stipulates prosecco, I used a cheap Asti for the trial run, and a Seppelt sparkling rosé for the real thing. It gave it a really pretty dusky colour. (See below). 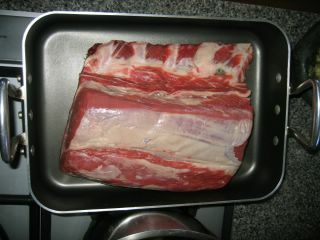 ... and covering it in an intensely flavoured paste of salt (1/2 a cup!! 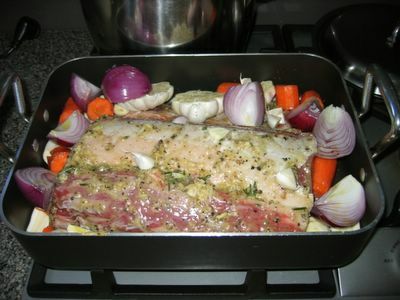 ), olive oil, pepper, thyme, rosemary, horseradish and garlic... before roasting it with some vegetables at 180C for 20 minutes a pound (44 minutes a kilo). 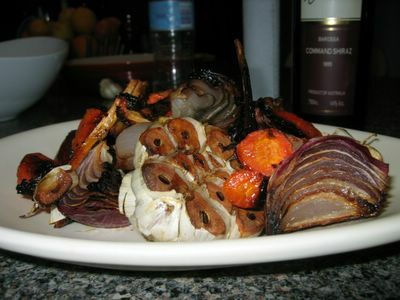 Roasted Vegetables - ooh pretty! 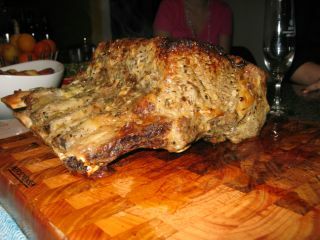 Tyler says this gives you medium-rare beef, but at the end of the cooking time, it was well done. It still tasted good, but next time I'll be more careful with cooking times. I covered the beef and the vegetables in foil, and finished off the side dishes and had a drink as our guests arrived (with champagne! Yay!). 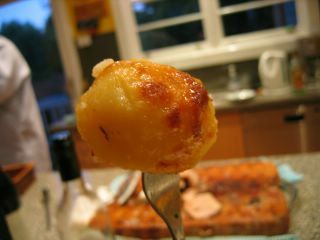 For the potatoes, they need a high blast in the oven for an hour (don't be impatient, because they are worth the wait!). See Feast or How to Eat for Nigella's roast potato method. They are amazing! The beans need to be boiled, and turned through butter and a chopped-up lemon. For the mushrooms, you slice them, and cook them in butter before adding red wine and the pan juices from the beef. And then, it is time to eat! 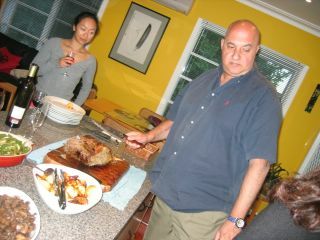 Joe watched me hack at the beef with my usual ineptitude before offering to carve it himself. He sharpened the knife (ooh, scary! ), cut the meat away from the bone, and then sliced it into delicious-looking slices. What a pro! Sliced beef - Mmm... delicious. The meal went down really well! Thank goodness! 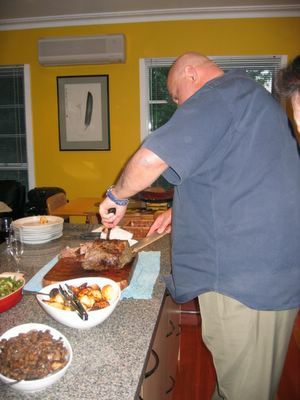 Tyler's recipe gave a fabulous flavour to an already fabulous piece of meat, and the mushrooms were a perfect accompaniment. 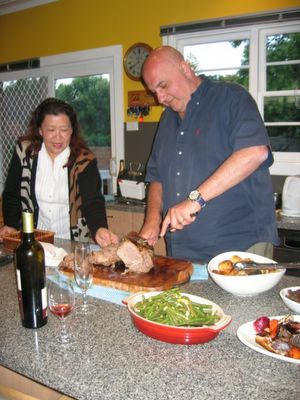 The beans were lovely and astringent against the rich beef. Now, the potatoes! 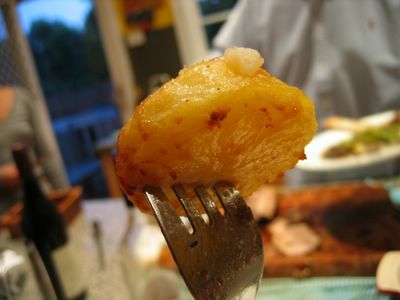 Everyone loves Nigella's potatoes, and I highly recommend her method for each and every potato lover of you out there. For dessert we had the jelly! It looked beautiful when I turned it out, but collapsed soon after. No-one seemed to mind though. Perhaps extra gelatine and a longer refrigeration time would benefit it. Richard also brought a banana cake from his bakery, which was fabulous. The dinner was so much fun! It was just so relaxed and enjoyable, and everyone got along really well. After eating, we moved onto the porch and kept drinking and talking into the wee hours of the morning. 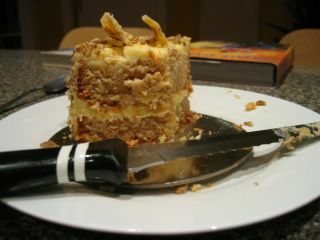 Banana cake - my breakfast the next morning. You are a pro at this!! You have no reason to get nervous. Everything looks delicious, but of course!! 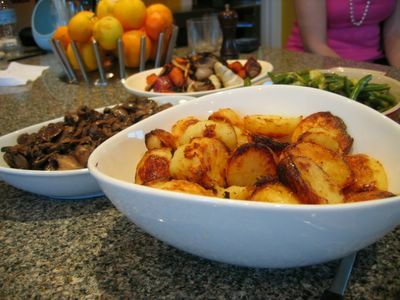 I have never tried those famous roast potatoes. I think it is that I don't usually have goose fat or semolina on hand. Is that what you used? great looking menu and good work under pressure too!